As a white, British A-level student, the 17-year-old boy on trial for plotting mass murder in Cardiff did "not look like how you expected a terrorist to look," the jury was told. But over the course of his nine-day trial at Birmingham Crown Court, they learned Lloyd Gunton had become radicalised online and was planning a "lone wolf" attack in the name of Islam. The court heard he was arrested "within hours of committing an act of atrocity on the streets of Cardiff" and his social media accounts featured pictures of terrorists and posts about a terrorist attacks. But what led him to take such action? Gunton lived with his parents in the Llantrisant area of south Wales. In late June 2017, he began posting material on photo-sharing social media site Instagram, promoting jihad and supporting Al-Qaeda. He published images of terrorists, as well as pictures of the so-called Islamic State flag, and photos encouraging a terrorist attack in Cardiff. The posts came to the attention of police, who swooped on his home, searched his belongings and seized his mobile phone and laptop. On his phone, officers found a YouTube video of the documentary "British Islamic Extremists" playing, which included clips of people praising those who carry out terrorist attacks. Two copies of an IS propaganda magazine were found on his laptop. One contained instructions about how to carry out a terrorist knife attack, while the other had details about how to carry out a terrorist attack by hitting people with a vehicle. Both praised terrorists and encouraged others to commit acts in the name of Allah. 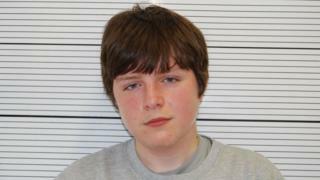 A search of the teenager's bedroom uncovered his school rucksack which containing a large kitchen knife and a hammer. There was also a martyrdom letter - claiming Gunton was an IS soldier and had attacked Cardiff in Allah's name - which the prosecution said was to be used to explain his actions in the event of his death in the attack. Matthew Brook, prosecuting, told the court: "Why would he have written such a letter? Because if you are going to commit a terrorist attack in which you presume you will die, you need people to know afterwards why you did it - it's a way of spreading the terror and the message of terror." What did police do next? Concerned that Gunton was plotting to carry out an attack in Cardiff, he was taken to a police station for immediate questioning. He told officers he had been talking for a week to a man called "Al Baghdadi" on Instagram, who told him he would go to hell because he did not believe in Islam. He said he had instructed him to research IS and a propaganda magazine and was told he needed to kill people in an act of terrorism if he wanted to go to paradise. He admitted he had posted material on Instagram about an attack in Cardiff, but claimed he did not mean for it to do any harm. He also accepted he had put the hammer and knife in his bag, but claimed he had not intended to attack anyone. He was later transferred to a police station in the Midlands for four days of questioning where he answered only "no comment". Despite his claims he had only been discussing terrorism online for about a week before his arrest, counter terrorism officers were able to prove otherwise. Analysis of his internet searches showed he had an "unhealthy interest in terrorism", and had searched IS leader Abu Bakr al-Baghdadi's name eight months before his arrest in late June. In the weeks before he was detained, his online searches included, "IS vehicle ramming", "how to hijack a truck" and "17-year-old Jihad", while his mobile phone contained images of the truck attacks in Nice and Berlin. The court heard he also researched possible target sites in Cardiff, including Cardiff Castle, New Theatre, Capitol shopping centre, Cardiff Central Library and Bridgend's McArthur Glen shopping outlet. Was 2017 the worst year for UK terrorism? Later, he looked up security arrangements for singer Justin Bieber's concert at the Principality Stadium on 30 June - and was arrested later the same day. Police also recovered a picture of the boy holding a gun whilst raising one finger towards the sky - a gesture often used by people associated with IS. He had looked up IS terror attacks around the world, included the stabbing of 10 people in Minnesota, as well as information on which knives were best for inflicting the most serious injuries. The internet search history on his laptop also revealed the teenager had looked for articles on IS executioner Jihadi John, the murder of Fusilier Lee Rigby, beheading videos and information on the group which carried out the London 7/7 bombing. Other research included how to pledge allegiance to IS and a question on "how does getting shot feel like?". During his trial, the boy told the jury he "never wanted to fight for IS" and had downloaded the literature on previous attacks to "strengthen" his anger towards terrorists. He said he had "always had an anti-terrorism view" and said he had searched for the material out of "gruesome curiosity". But the jury disregarded his claims, convicting him of engaging in the preparation of a terrorist act, encouraging terrorism, and possessing terrorist information. He was given a life sentence with a minimum term of 11 for planning an Islamic State-inspired vehicle attack in Cardiff.